"Let's go work on some fighting moves." meowed Jaggedfeather as he touched noses with Frostpaw. Brindlepaw dug her claws into the ground for a moment, enjoying the satisfaction, then headed over to Brokenheart. "Go get to know your new denmate." meowed Brokenheart as he touched noses with Brindlepaw. "Bluepaw, Whitepaw, Frostpaw, Brindlepaw!" cheered Frostnose for the clan's newest apprentices. Cherrymuzzle padded out of her den, dragging the body of Brokenheart in her jaws. She made her way to the center of the clan camp, arranging the deputy's body so the clan could grieve. Toadpelt padded over and pressed her nose into Brokenheart's fur. 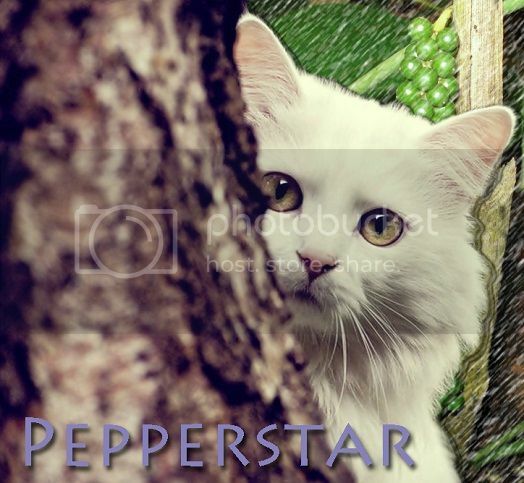 Pepperstar pressed his nose into Brokenheart's fur, then tossed his head back in a yowl. "Cats of OwlClan. Listen, And I will appoint the new deputy. I say these words before StarClan so our ancestors may hear my approve and choice...Riversmoke will be the deputy of OwlClan!" "Thank you, Pepperstar." meowed Riversmoke with a dip of his head. "Riversmoke, Riversmoke, Riversmoke!" cheered Fruitwater for the clan's new deputy. Cherrymuzzle padded into the OwlClan camp, carrying cobwebs in her jaws. She made her way into her den, placing the cobwebs into the storage. Grayfox pricked up her ears and padded over to hear what Pepperstar had to say. "We gather today to welcome three kits into their lives as apprentices." continued Pepperstar once the clan had gathered. "Featherkit, you will be known as Featherpaw. Heavyfur, you will be mentor to Featherpaw. Raggedkit, you will be known as Raggedpaw. Ebonytail, you will be mentor to Raggedpaw. Scorchkit, you will be known as Scorchpaw. Since you have shown an interest in healing, Cherrymuzzle will be your mentor." Featherpaw snorted to himself and headed over to Heavyfur. "Let's go check out the territory." meowed Heavyfur as she touched noses with Featherpaw. Raggedpaw let out a loud yowl and raced over to Ebonytail. "Go get to know your new denmates." meowed Ebonytail as he touched noses with Raggedpaw. Scorchpaw padded across the clearing to Cherrymuzzle. "Let's get you a nest sorted out and go over some basic remedies." meowed Cherrymuzzle as she touched noses with Scorchpaw. "Featherpaw, Raggedpaw, Scorchpaw!" cheered Dustheart for the clan's newest apprentices.